The value of your investment will vary depending on the performance of the investment options you choose. 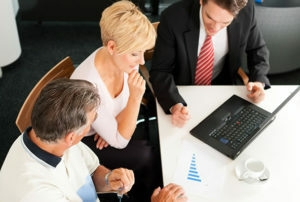 The investment options for a variable annuity are typically mutual funds that invest in stocks, bonds, money market instruments, or some combination of the three. As you make purchase payments you can allocate a percentage to a number of investment options. For example, you could designate a portion to a bond fund, a different portion to a U.S. stock fund, and the remainder to a money market fund. The money you have allocated to each mutual fund investment option will increase or decrease over time, depending on the fund’s performance. As with other types of annuities you can purchase features such as death benefits, lifetime income, nursing home benefits, and items like bonus credits where the insurer matches some percentage of your purchase payments. Variable annuities also include surrender charges if money is withdrawn faster than allowed by the contract. When the payouts begin, you may receive your purchase payments plus gains as a lump sum payment, or you may decide to receive payments at regular intervals. If you choose to receive payments at regular intervals, you may have a number of choices of how long the payments will last. The principle advantage of a variable annuity is the ability to move assets within the annuity from one investment type to another without having to pay tax on the gain of the asset sold. Since annuities are purchased for long term asset appreciation, it is likely that over time different investment types will outperform others thus being able to switch types without tax penalties can be an advantage. However if losses occur then losses cannot be used to offset gains. The value of the investments accumulates tax free and is taxed as ordinary income when withdrawn. The most obvious disadvantage of variable annuities is that the investment is at risk. There is no limit to the possible loss of the investment as there is no limit to the possible gains. A less obvious disadvantage of variable annuities compared to other types of annuities is the cost or fees applied. The managers of the mutual funds charge fees as do employees of the insurance company that manage your account. In addition there are administrative fees, mortality and expense risk charges and fees for any additional benefits purchased. It is not uncommon for fees to total 4% or more annually. Many financial advisers suggest rather than purchase a variable annuity, it is better to just invest directly in the mutual fund and avoid all of the fees and achieve the greater tax advantage offered by the tax treatment of long term capital gains and losses. In fact Suze Orman has a video expressing a similar thought seen at “No to Variable Annuities Says Suze Orman“. To see how the fees and market losses can affect overall performance, consider the following simple example. Assume a variable annuity was purchased for $100,000 in 2003 and invested in the S&P500 index fund. From 2003 to 2012 the index fund only had one losing year and 9 years with positive gains. If the money had been invested directly in the S&P500 index fund the total value of the fund would be $162,080 in 2012 neglecting the small fee charged by the index fund manager. The variable annuity on the other hand with a typical 4% per year fee would only total only $108,920. That is a gain of only about 9% over a ten year period. As a point of interest the same money invested in a fixed index annuity would provide considerably better performance for two reasons. The one year where the S&P500 lost value has no negative affect on the annuity value and the annual fees are negligible for the basic annuity because the insurance company protects itself through factors such as the participation rate and the cap or maximum gain allowed each year. Using typical values of 50% participation rate, a guaranteed minimum of 3% for any year, and a cap of 8% the annuity value in 2012 would be $166,330. Since the value of $166,330 is greater than that of the underlying stock fund it is likely the insurance company would have adjusted the participation rate and the cap sometime during the decade. If the insurance is going to guarantee future payments they must make a profit on the sale of annuities. In summary, variable annuities offer an advantage of being able to adjust one’s portfolio at any time without tax penalties thus allowing the investments to accumulate tax free. However this advantage comes with increased expenses compared to a direct investment in the portfolio, the loss of capital gain and loss tax treatment, and significant market risk and large fees compared to other annuity types. Because of having little market risk and significantly lower fees, fixed index annuities will generally offer greater performance than variable annuities. To learn more about annuities and how they may fit into your retirement income plan, we urge you to watch our free educational video series. Then, give us a call at (972) 473-4700 to discuss your specific situation.